Braces. This seems to be every child's (and parent's) worst nightmare. Children are forced to wear a bunch of metal in their mouth for several months and parents dread getting the bill. While braces can't always be prevented, genetics do play a role (for instance being born with an over or under-bite), there are some things you can do now to prevent the need for braces later. While your child may enjoy having a bottle to carry around all day and love going to bed with it at night, any time your child sleeps, the bottle should be taken away. Having the bottle at naptime or bedtime increases the likelihood that your child will fall asleep with it in his mouth. The formula, juice or milk inside can pool in his mouth and the sugars can linger on teeth. Bacteria then feed on these sugars, creating dental caries. Tooth decay in young children can lead to premature loss of baby teeth, and if a tooth falls out before it is ready, this increases the chances that the permanent tooth will grow in incorrectly. Many children naturally have oral fixations. In fact, in order to self-soothe, you may find your child sucking on his thumb. In order to break him of this habit, you give him a pacifier. Many babies are even given pacifiers long before they learn how to self-soothe. Both of these things can actually affect the development of your child's mouth. Not only can it affect jaw development, it can also affect future tooth alignment. Instead, give your child a teething device to help with sucking desire. Start even before your child's first teeth come in. Clean gums with a cloth and warm water. When teeth do start coming in, brush them after every meal. When your child gets older, teach him how to properly brush his teeth and how to floss. Proper oral hygiene now will prevent tooth decay and gum disease, giving his adult teeth a chance to come in properly later on. 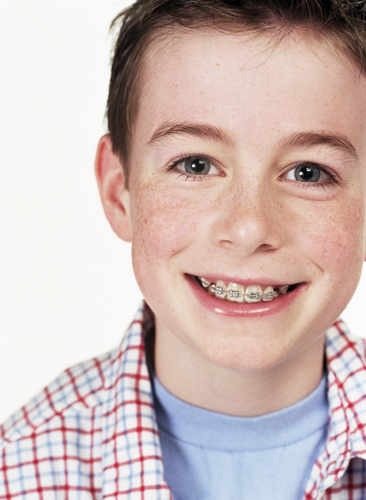 Braces are often feared by parents. Sometimes, they are unavoidable. But there are steps you can take at an early age to prevent the odds that your child will need them once his permanent teeth all come in.